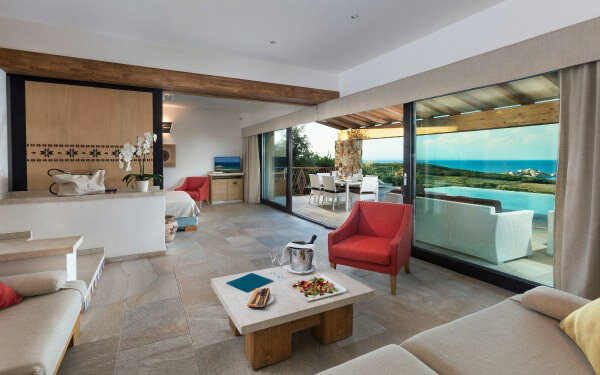 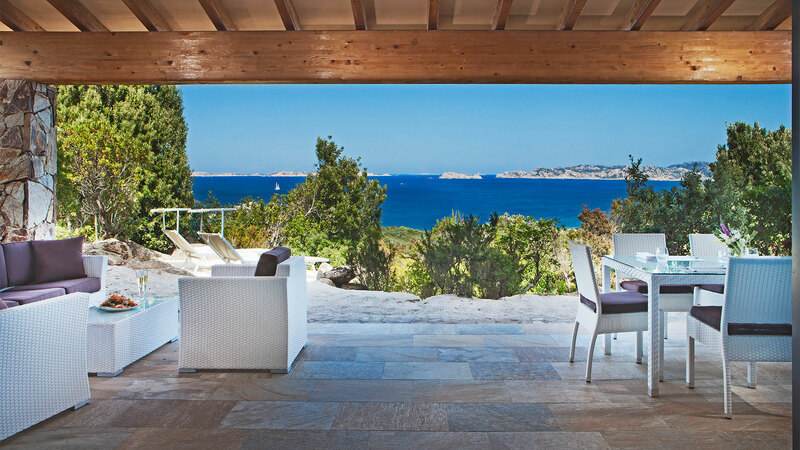 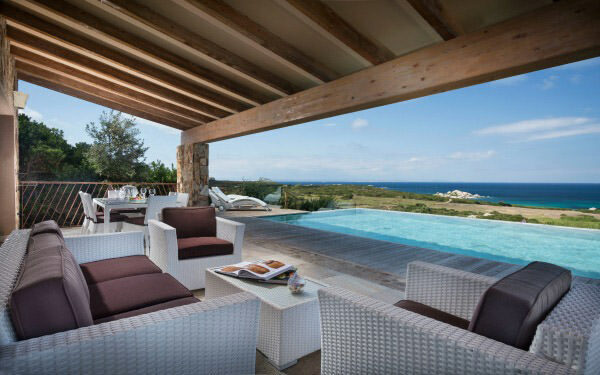 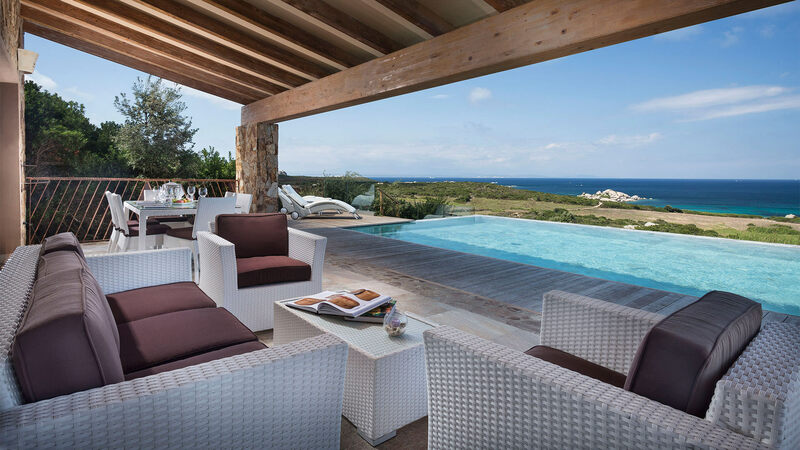 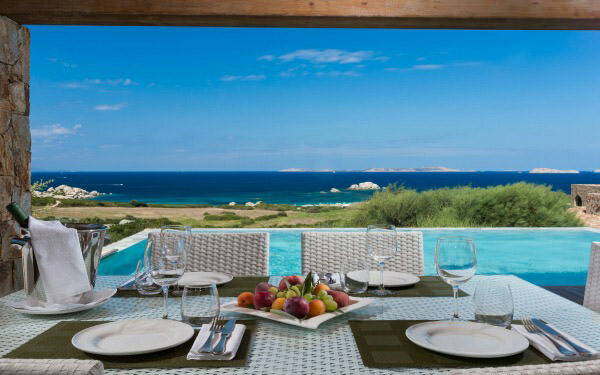 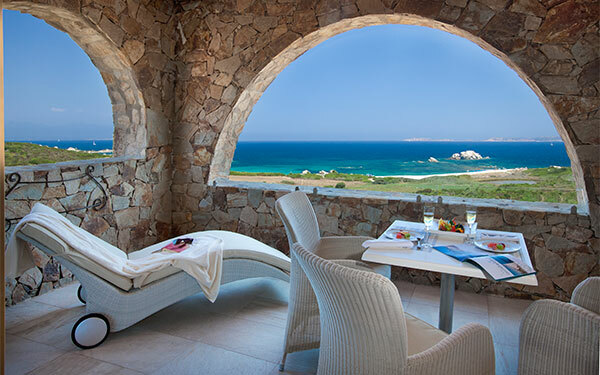 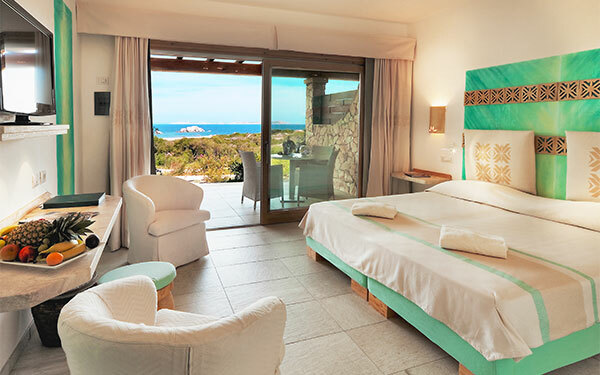 Find out more about the rooms at the Resort Valle dell’Erica at Santa Teresa Gallura. 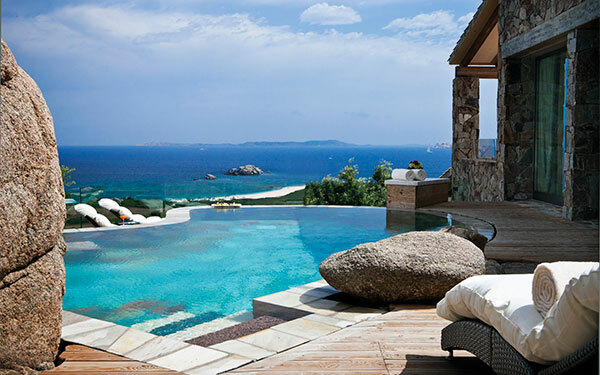 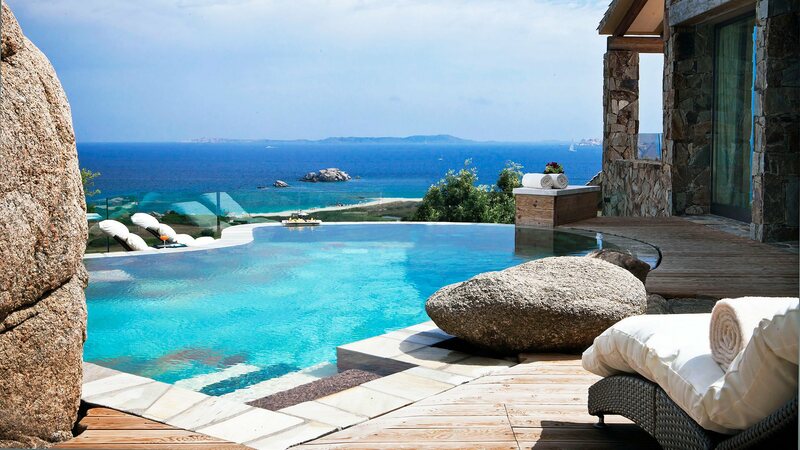 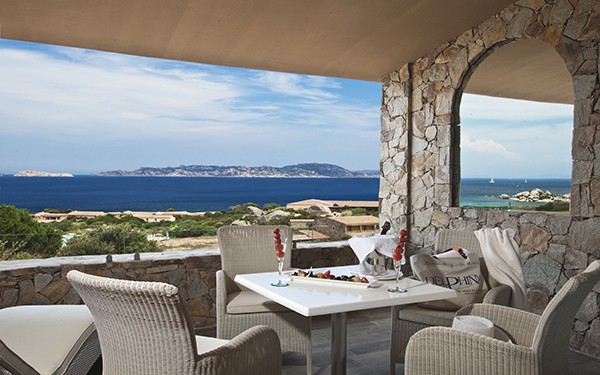 Two 5 star hotels in the North of Sardinia and prestigious rooms suitable for all your holiday requirements. 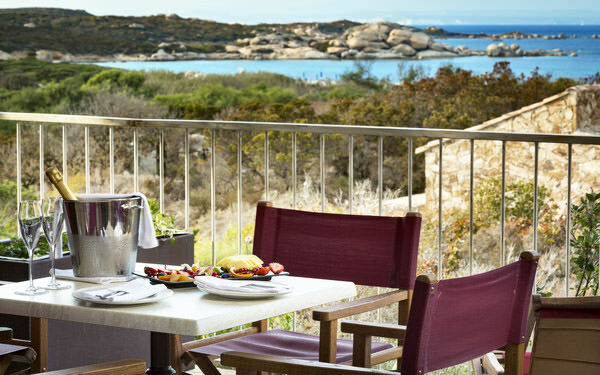 The rooms at the Hotel Erica are elegantly furnished in fresh Mediterranean style, looking out onto the resort’s gardens and facing the magnificent sea of the La Maddalena Archipelago. 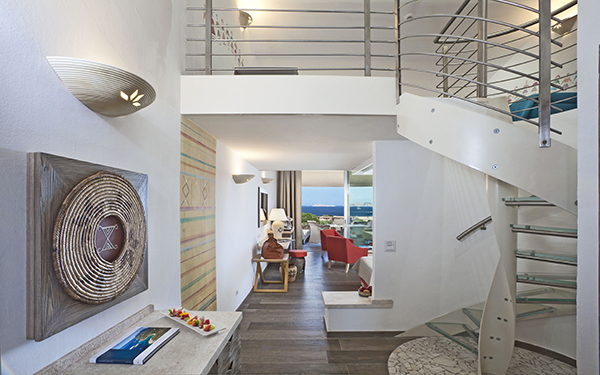 All on the ground floor, they will give you a peaceful sense of relaxation during your holiday. The rooms at the Hotel La Licciola, are in a modern and elegant style and are embellished with authentic works of Sardinian handicrafts. 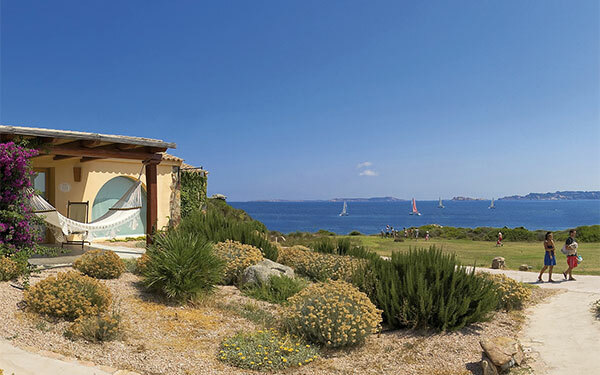 The traditions of the Gallura area can be seen in the woods, ceramics and fabrics used that provide a total immersion in the culture of the North of Sardinia. 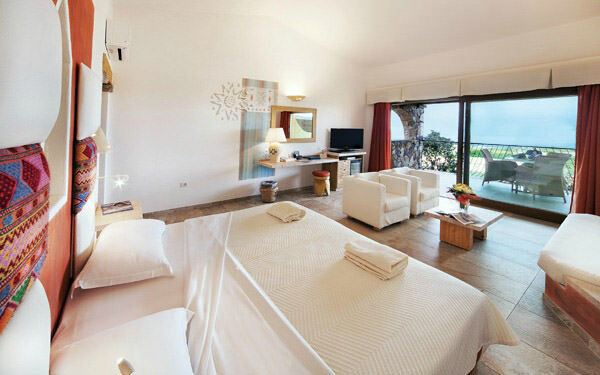 Prestigious rooms and Junior Suites from between 80 and 200 metres from the sea and with independent entrances. 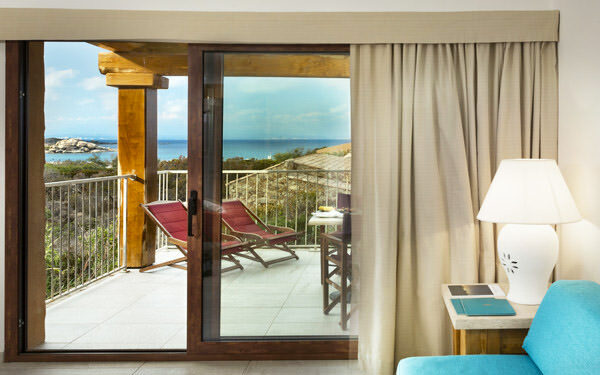 They all have covered and furnished verandas, bathroom with shower, hairdryer, air conditioning, telephone, safe, minibar, bathrobes for adults and beach towels. 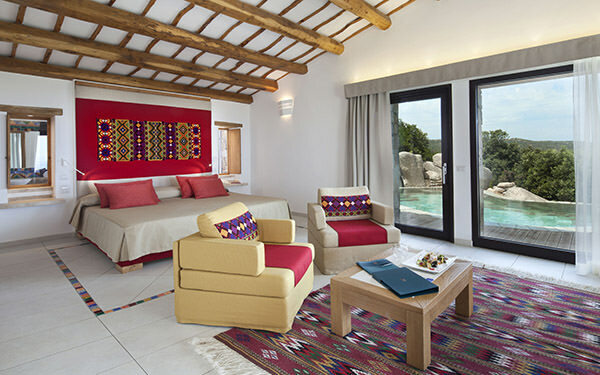 Twin beds available on request. 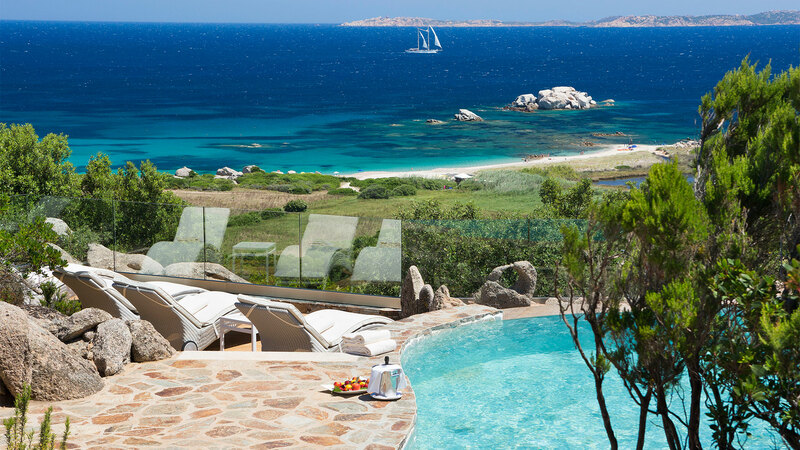 For adults in the Giglio and Orchidea Benessere, there is free entrance to the Wellness Centre (during opening hours and booking required) with free use of the Thalasso pools, Turkish bath, sauna, cardiofitness gym and relaxation area. 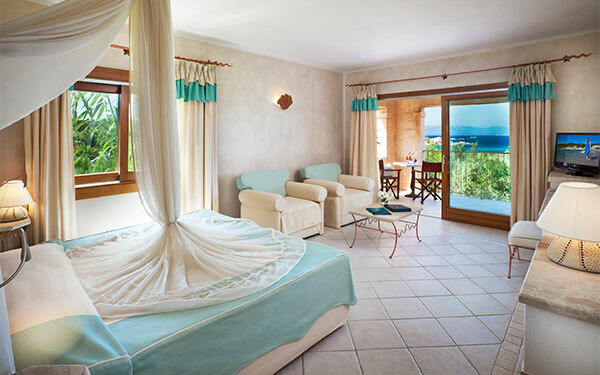 Welcoming room with double bed decorated in Mediterranean style by expert local craftsmen, for two adults. 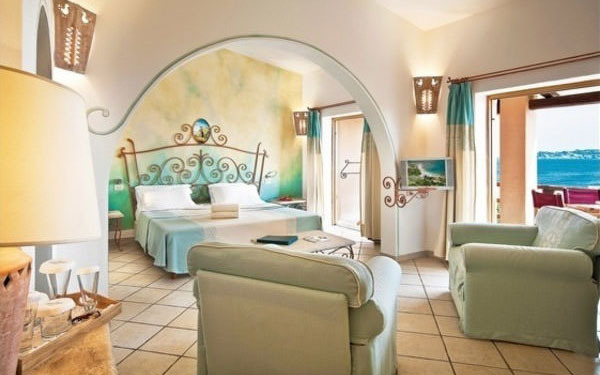 Larger room than the Classic with a double bed for two adults and the option of sleeping a child aged from 0 to 1 year old in a cot. 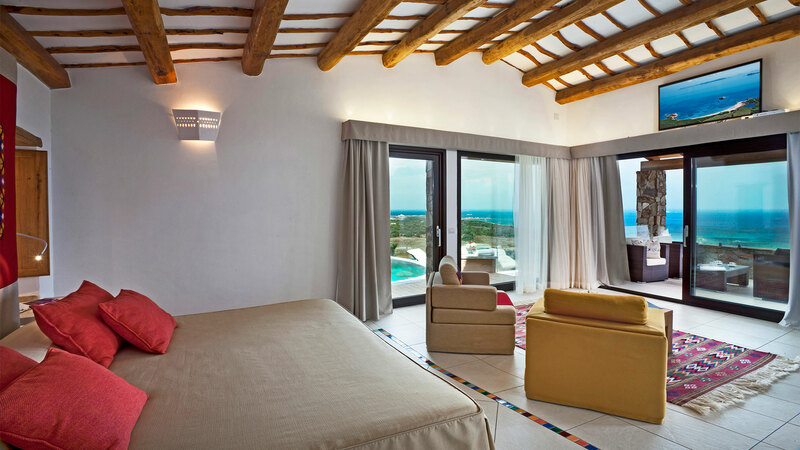 Spacious and prestigious room with double bed for two adults, open plan living room with built-in single sofa bed to sleep a child up to 11 years old, plus the option of a cot for a child aged from 0 to 1 year old. 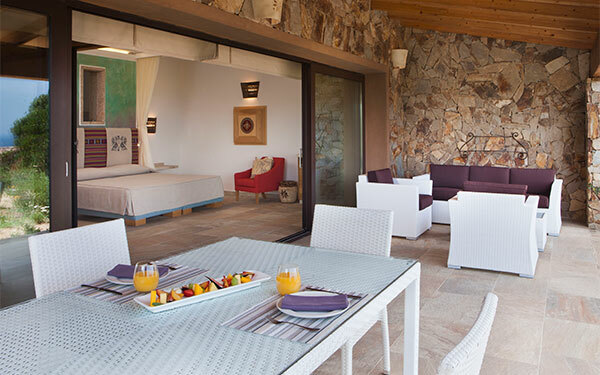 The furnished veranda and hammock will give you unforgettable moments of relaxation. 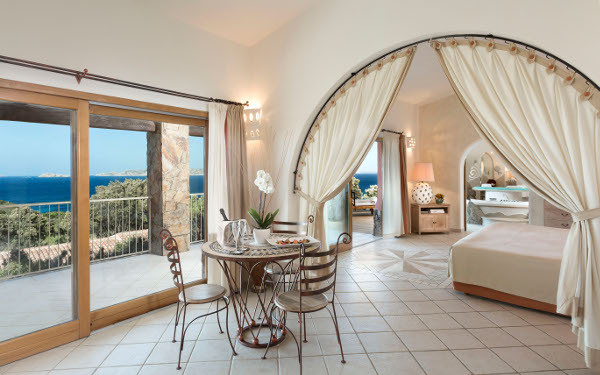 Elegant room lovingly furnished in Mediterranean style with double bed for two adults, open plan living room with a pull out sofa bed (or built-in sofa bed) to sleep two children aged up to 13 years old. 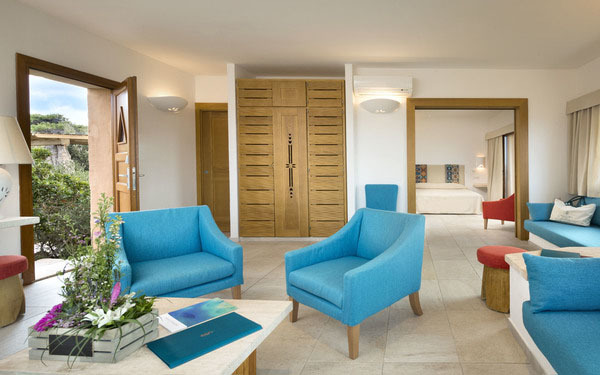 Four stupendous rooms located within the Wellness Centre, designed for couples looking for moments of magic and wellbeing. 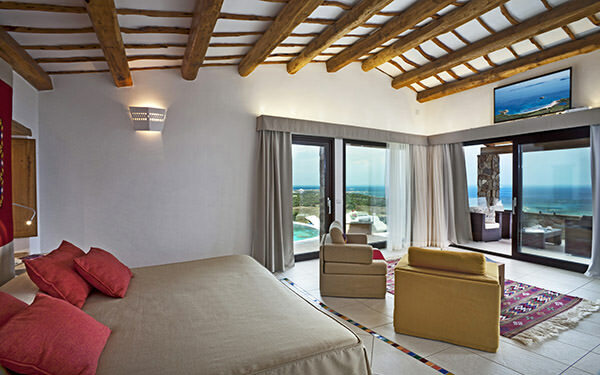 Extremely comfortable rooms with particularly beautiful furnishings, large double bed and splendid verandas. 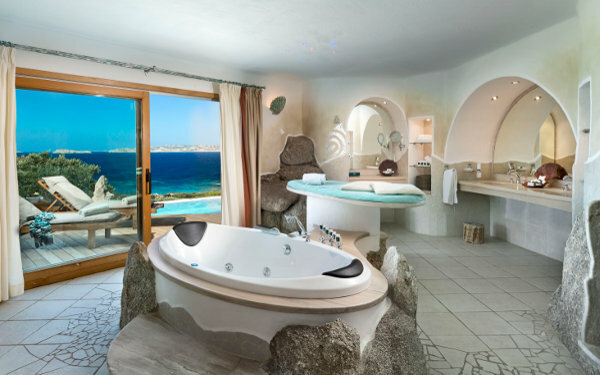 For two adults (minimum 14 years of age). In addition, there is the bonus of direct access from the veranda to the Le Thermae Thalasso Centre & SPA (during opening hours and booking required) with free use of the Thalasso pools, Turkish bath, sauna, cardiofitness gym and relaxation area. 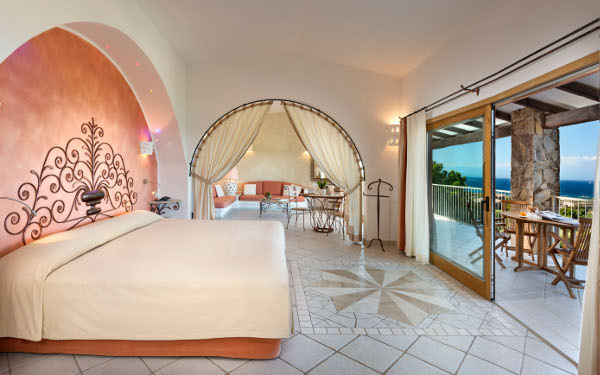 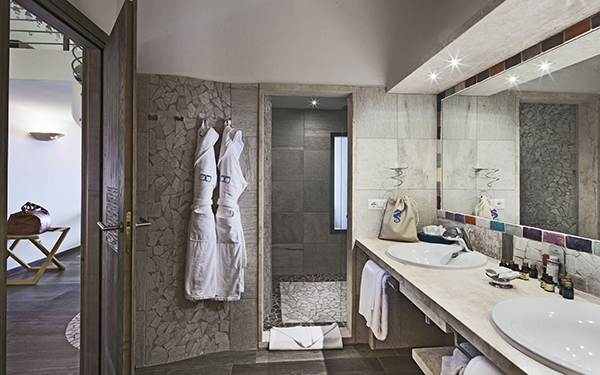 More spacious than the Giglio Benessere, two prestigious rooms located within the Wellness Centre, designed for couples looking for moments of magic and wellbeing. 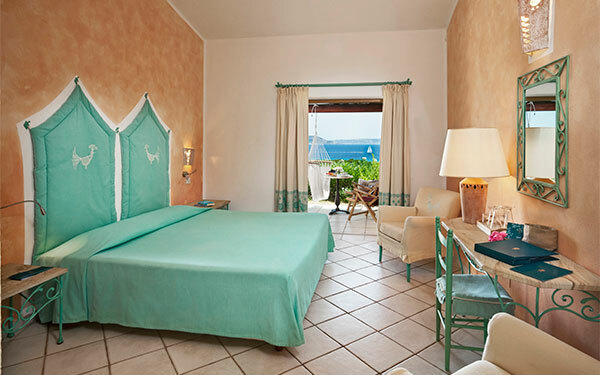 Extremely comfortable rooms with particularly beautiful furnishings, large double bed and splendid verandas. 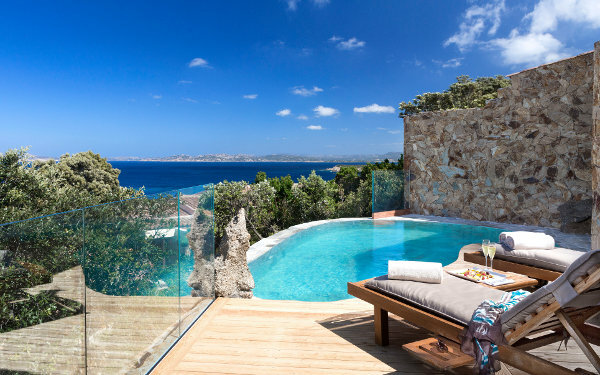 For two adults (minimum 14 years of age). Comfortable accommodation consisting of two internal communicating Superior Erica Sea View rooms each of them with a double bed and ensuite bathroom. 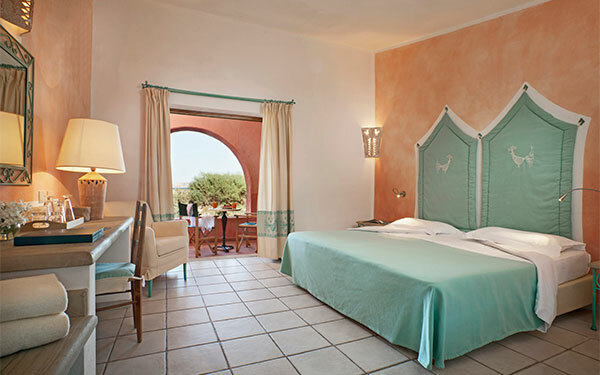 For four guests plus the option of a cot for two children aged from 0 to 1 year old. 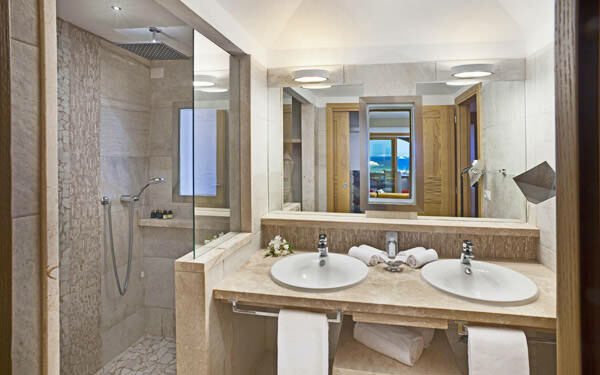 Spacious and comfortable room, perfect for families with children and consisting of a Junior Suite Mirtilla Sea View room with internal access to a Classic Sea View, each of them with double bed and ensuite bathroom. 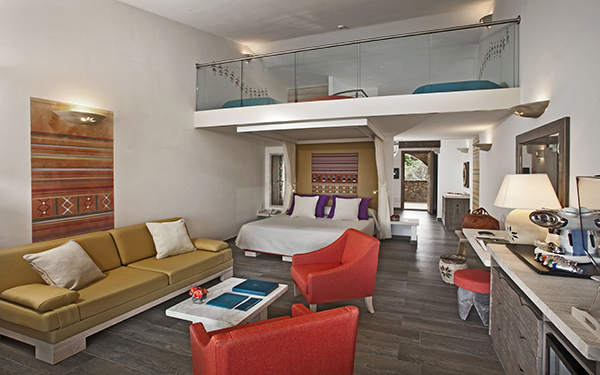 For four guests plus the option of sleeping two children aged from 0 to 13 years old. 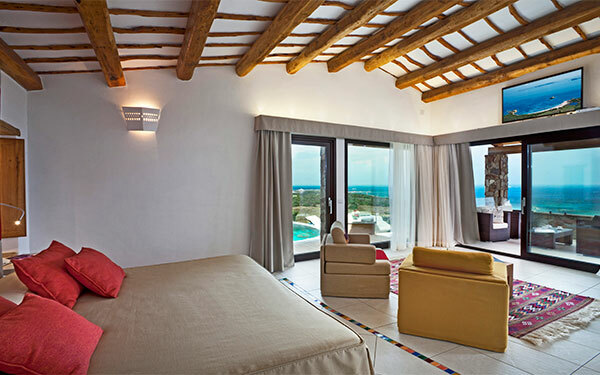 Spacious and prestigious room with double bed and living room with a pull out sofa bed (or two built-in sofa beds) which can be separated from the bedroom with a wood inlay sliding door. For two adults with the option of sleeping two children from 0 to 13 years old, plus the option of a cot for a child aged from 0 to 1 year old. 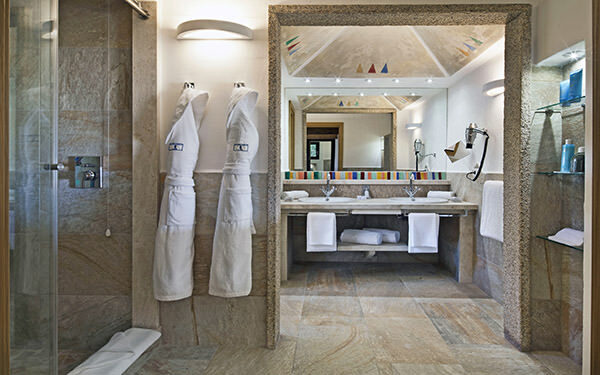 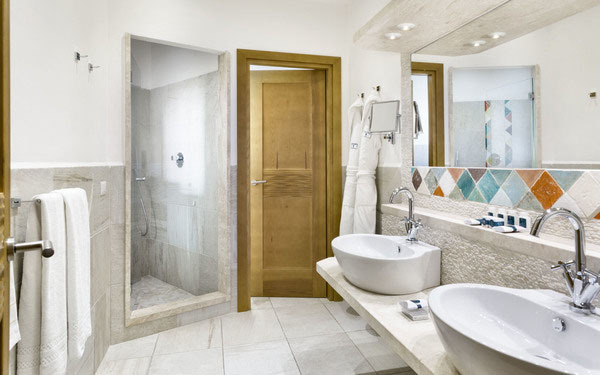 The prestigious rooms and Suites at the Hotel La Licciola are set on the ground and first floor and all have independent entrances, covered and furnished verandas, bathroom with shower, hairdryer, air conditioning, telephone, safe, minibar, bathrobes for adults and beach towels. 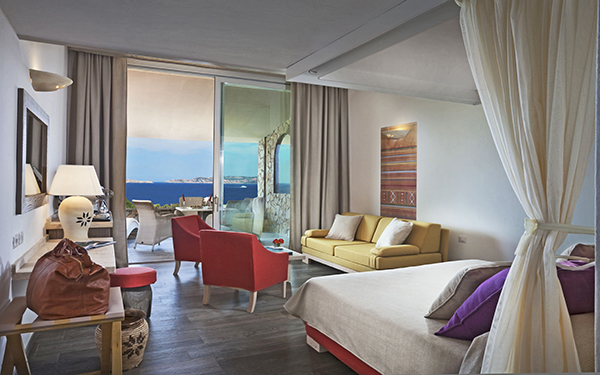 Twin beds available on request. 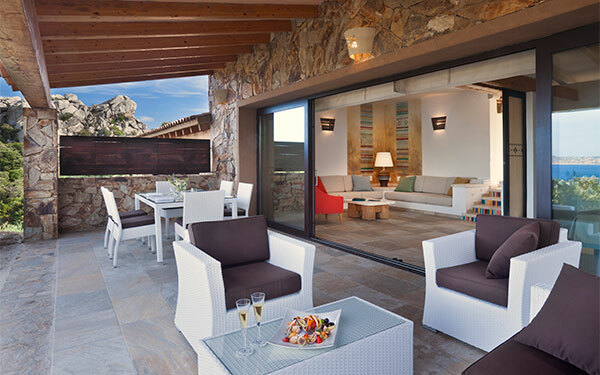 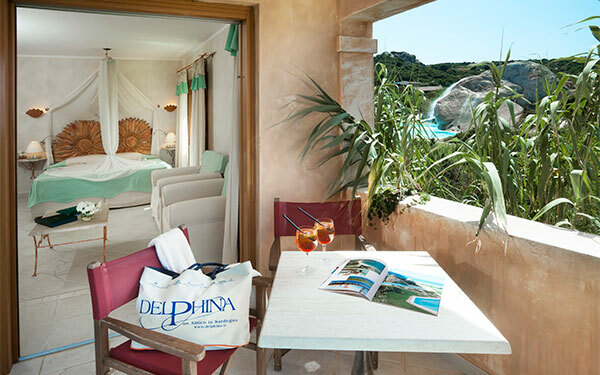 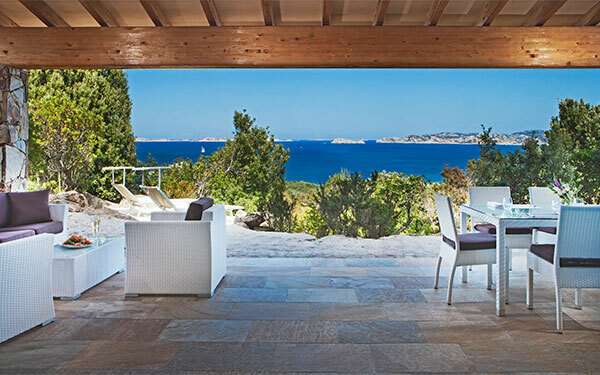 The Suites Arcipelago Sea View, President Razzoli Sea View and Imperial Suite Sea View are all in the most panoramic part of the Resort Valle dell’Erica with a splendid view of the islands of the La Maddalena Archipelago and Corsica. 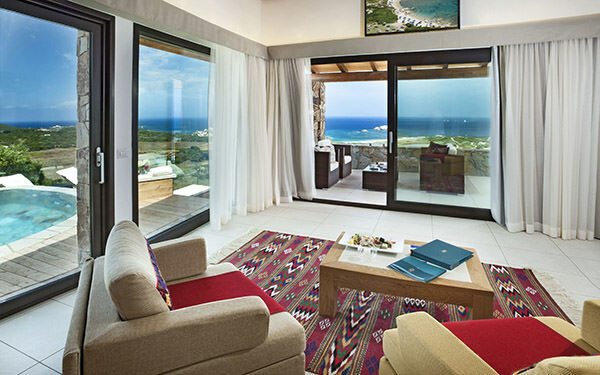 The Exclusive area is reserved for guests over 6 years of age; prestigious rooms all on the first floor in a panoramic setting with sea view included. 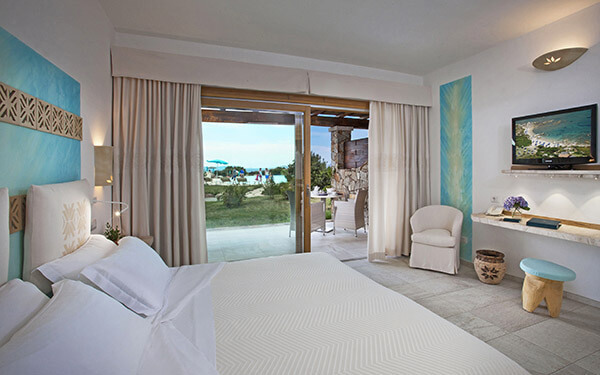 These rooms also have the use of a swimming pool and a solarium from which to enjoy a wonderful view of the beautiful white Licciola beach. 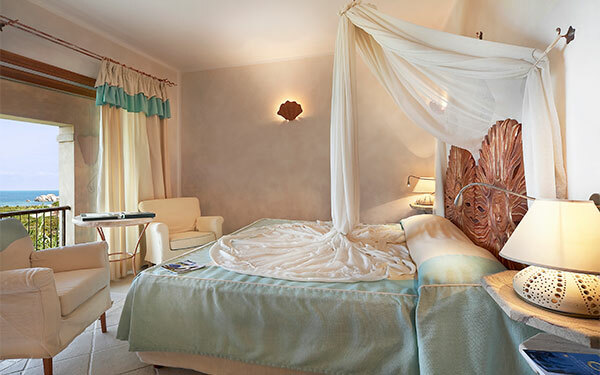 Free cot to be requested at time of booking. 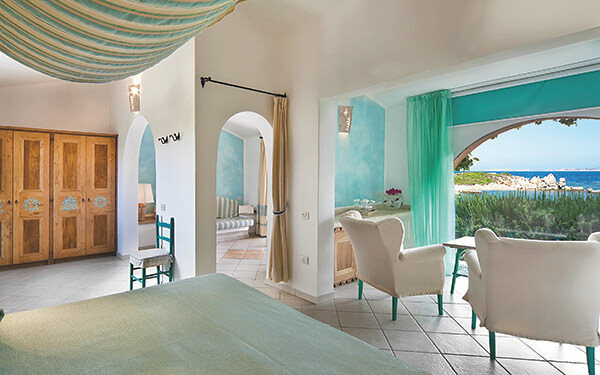 Rooms are available from 15:30 (earlier if available) and should be vacated by 11:00 on the day of departure. 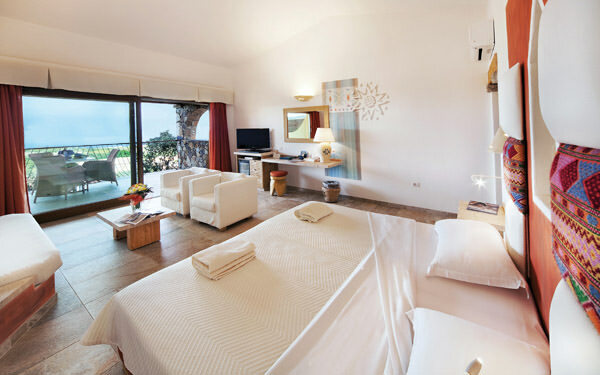 Comfortable accommodation consisting of two internal communicating Superior Licciola rooms, one with sea view, double bed and the option of a cot, the other one with double bed and one sofa bed. 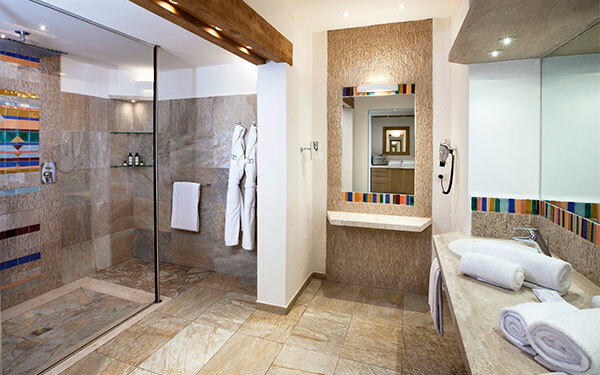 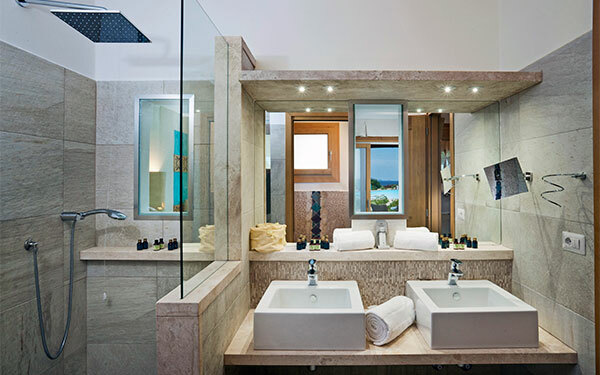 Each room with own bathroom with shower. 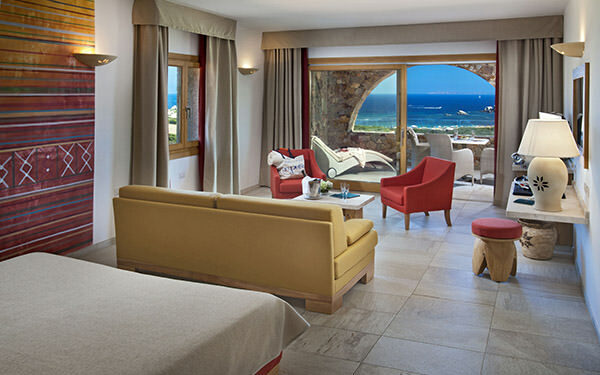 For four guests with the option of sleeping a child aged from 0 to 13 years old and a child aged from 0 to 1 year old in a cot. 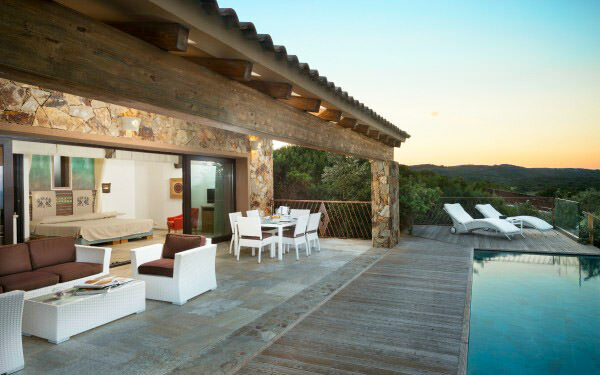 (74 m2 + 2 verandas of about 11-13 m2 each). 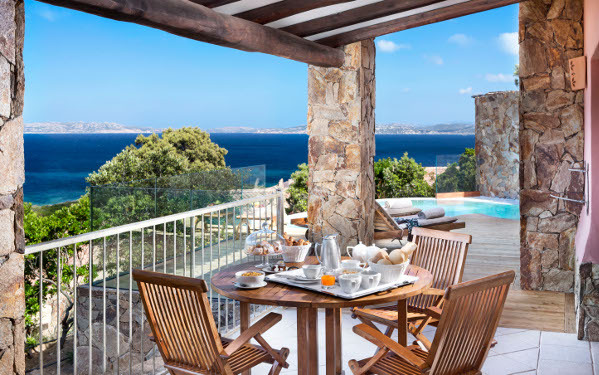 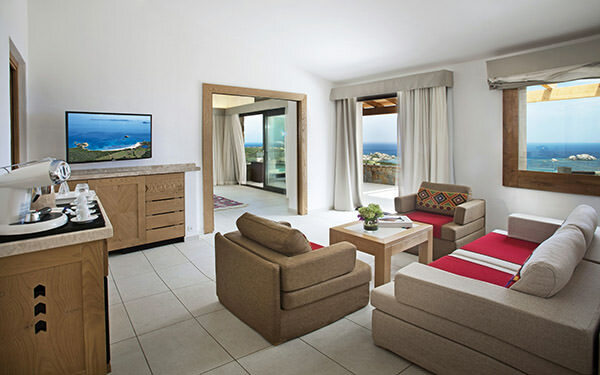 Spacious and luxurious suite with a total of 154 m2 split over two interconnected floors (with independent entrances) with private pool in the garden, fully furnished solarium with outside shower and marvellous views over the islands. 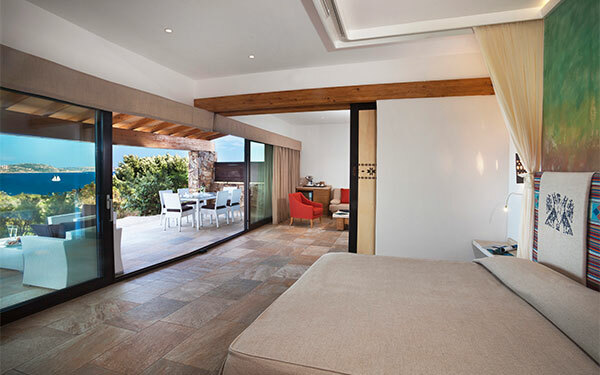 There is a bedroom with double bed on both floors and an open plan living area (which can be separated from the bedroom with a wood inlay sliding door) with accommodation for two people (two single sofa beds on the first floor plus a built in single sofa bed and a single sofa bed on the ground floor), a bathroom, spacious covered panoramic veranda with furniture and dining table. 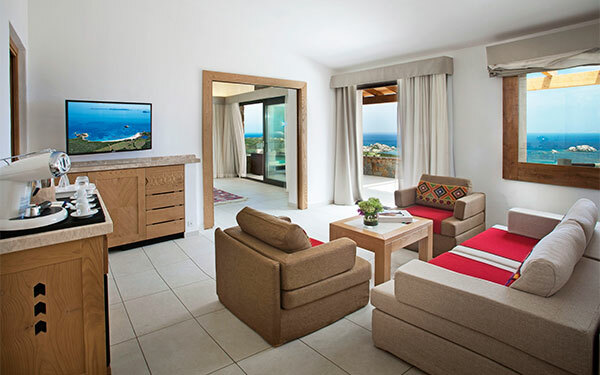 The accommodation can host up to eight adults plus two children from age 0 to 1 year old in cot.